In the morning of 3rd Decemeber Marko Mikkilä packed his halo gear and drove 200 kilometers to Sotkamo, where snow guns were running at the local ski resort. Once he arrived, there was fog, but it was mainly water fog and only occasional poor halos were seen. However, when darkness fell, the water fog cleared off and diamond dust started kicking in as the air got colder. In the beginning the moon showed no good halos but spotlight gave a reasonable display ( 1 ). 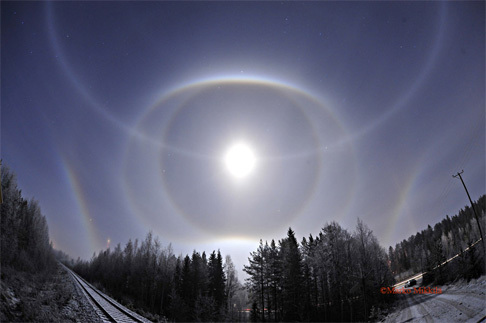 Later also the moon halos catched on, as is seen above. Click on the image for more photos. Simulation of the display ( 2 ) needed slightly flattened columns to get the subhelic arc intensity right. With any other crystal shapes, the part opposite to the moon where this halo is tangent to Tricker arc, was not visible. Intuitively those flattened crystals would take Parry orientation, so it looks like again we are not really understading it. Same effect was also present in the great Himos display last winter ( 3 ). After midnight Mikkilä headed home because the high clouds in the background were becoming too disturbing. All together the halo hunting trip took 600-700 km of driving. Looking at the results it was definitely worth it. See also the photos by Jari Luomanen from the same night at the Sappee ski resort, and be sure to read his insightful description of the diamond dust formation on the right ( 4 ). Amazing! This is what I call dedication to the cause. If you drove 700 km from Budapest, Hungary, you could actually cross three borders and get almost as far as Venice, Italy. Wonderful pictures. And the simulation looks so perfect and realistic, Marko! Mikkilä is the man. I just wonder how much those high clouds took off from the display. The subhelic arc would have been better distinguished at least. The link 1 photo indicates again triangular crystals, because of the strong diffuse-B, lack of Tricker and weak diffuse-A and the presence of strong zenith intensity treshold. But the lamp photo taken later with good Tricker indicates more hexagonal crystals. I think I'm going to be sick just watching these images. Over here no minus temps, no halo clouds...only low grey cloudfront from morning til evening. I got sick when Mikkilä photographed the Kern. For two days there was a low gray cloudfront in my soul. Talks about determination Marko!!! If I only knew how to get to Perfect North Ski slope I would do it I just need a Tom Tom GPS. Another question marko why is the gallery for the halogun password protected? The problem is still the same: I don't drive. :( Otherwise I'd love to go to Lysa hora, as well. Mikkilä is to be congratulated for his determination and persistence. We spoke on the phone at least a dozen times that night while I was shooting In Sappee and Marko was capturing the lunar display of his life. Magical! There appears to be a similar feature as in the himos display in January: the subhelic arc extends right to where the Tricker arcs are in the anthelic region. This is exciting. I happened to add link to your Himos display photo, Jari, just before your comment. Mindreading! Did you? Wow, now that's a coincidence! I remember having poor luck simulating that part of the Himos display until you came up with those modified crystals. It's a puzzle. The effect in the Himos display can be seen perhaps a bit better in this frame. Great display Mig! It is great to be rewarded after such driving around. The last few postings---Toivo's Parry arc, Mika's lunar, and Marko M's lunar---are all great. The oldtimers like Huygens, Bravais, and Wegener would have been thrilled to see the low sun (moon) circumscribed halos. When was the first good photograph of a low sun circumscribed halo? There are not so many of them. Look at the strength of Marko's circumscribed halo in the 8:00 region (in the main posting); that is a region that should theoretically be weak. It is amazing. I was looking at the same thing and asked Mikkilä if he has even lower elevation photos of the circumscribed halo. Well, the forest would block it. But I think Mikkilä set here nevertheless a record of the lowest light source circumscribed halo and now the race for ever lower elevations has begun. When you see Moilanen arc - look below the sun!